About this time last year I went up to Philadelphia to play around with my new video camera at the Bilenky Junkyard Cross, a holiday party masquerading as a cross race or vice versa. This event is nuts and if you have the time, you should definitely check it out. The course winds its way through a working junkyard and includes flyovers, teeter-totters and fluids. Lots and lots of fluids. I shot all day and threw some raw footage of the race up on the Internet. Many, as in tens of thousands, curious people checked it out. That was really cool. I went back to Philadelphia earlier this year to interview some of the folks who raced and also to talk to the event’s host, framebuilder Stephen Bilenky. After going through dozens of edits, I ended up with an eight minute short film that I submitted to the Bicycle Film Festival. Out of the hundreds of submissions, the Bilenky Junkyard Cross was chosen to travel the world as part of the BFF’s shorts program. That was also really cool. The one drawback to being part of the Bicycle Film Festival is that I agreed to delay posting the video on the Internet for everybody to see. This bummed me out a bit because I really want to share it with all of you. With the BFF 2011 winding down and the 2011 Bilenky Junkyard Cross race scheduled for December 18, I figured now was as good a time as any to post the short for all to see. This was my first attempt at making a short film and it was a ton of fun to make. It was made a whole lot better with the help of several people. Sean O’Donnell and Ryan Dudek strapped on helmet cams for the race, put in a full day of helping with and participating in interviews, and gave great feedback during editing. Linda Mattioni and Kris Molendyke were great sports and added sooo much to the story. For the two festival showing of the film I saw, Kris pretty much stole the show. Stephen Bilenky allowed us to invade his shop for a day and share the story of how Bilenky Cycle Works was started. I also owe a huge thank you to Peter Nicoll and Bruce Buckley. 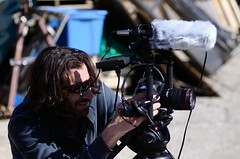 Peter is a filmmaker by trade and could not have been more giving of his time and expertise. Bruce is a pro photographer who continues to give me tons of insight on what makes a good photograph. I trust his eye more than most anybody else I know. Both of these guys willingly sat through close to 20 edits of this film and helped improve the final product each time. I hope you enjoy the film and thanks for watching. I saw this at he Chicago Bike Film Festival. It was my favorite film…good job.